The brew day went pretty well yesterday, though I did spill something on myself pretty much every step of the way. Turns out boiling water hurts, even when you spill on your non-waterproof shoes. Who knew? This is possibly one of the darkest beers I’ve ever made. Also, I could have purchased a few pounds less of the 2-row. Our current mash system is in two buckets (though our next bash will be in a 15-gallon mash tun cooler. YES!). I didn’t even need to really use the second mash since we got so much sugar out of the first one. For the Caraway Seeds, I poured a tablespoon of them on a cutting board, and used another cutting board to crush them a bit. I just added these to the mash for this batch. Depending how strong the flavor is, I might add them to the boil next time. The other day, I was eating a delicious sandwich. It was peppered turkey, pepper jack cheese, and spicy mustard, on a nice Jewish rye. At some point, I was nibbling on a rye seed, and BAM, it opened up. Utterly delicious. So much flavor in that one little seed. And I thought, “hmm, this is utterly delicious! I should make beer out of this.” And thus, a recipe has been developed. I decided to make a Dry Stout, but a Wheat was also in the works. Let me know what you think of the following recipe, any tips you might have, etc. I’m thinking a nice long mash and a 60 minute boil should do the trick. I’d like to get a slightly creamy, very slightly hoppy, dry stout with a tinge to slight rye flavor. 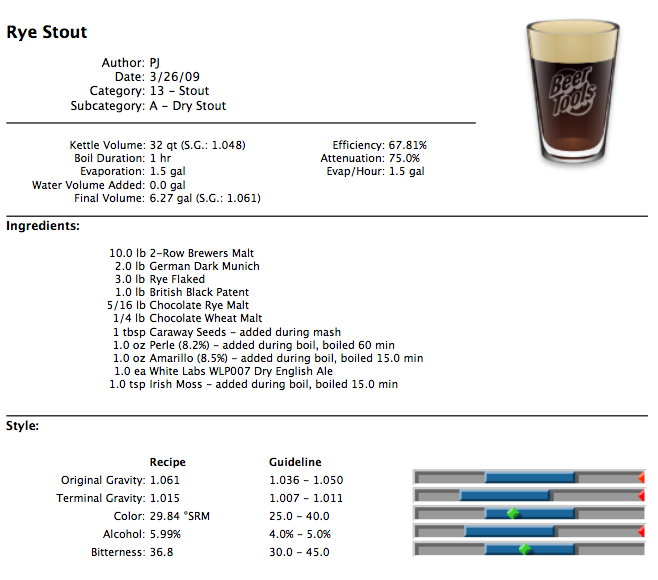 According to Beer Tools (I’m at work, I can’t do all the math right now…), this should result in approximately 1.060 OG, 1.015 TG, a brown/black color (32.54 SRM), ABV of almost 6%, and a bitterness rating of 34.8. The image below is the actual output in Beer Tools. For those who have played with rye before, let me know what you think! For anyone else who knows what those numbers mean, let me know your thoughts too. And for those who have no idea what I’m talking about, ask questions!